Do you need some shortcuts for the kitchen? Gooseberry Patch’s “Almost Homemade” cookbook is packed with plenty of recipes that are “almost” home-cooked! Find some tips, tricks, and shortcuts that will have your family think you slaved for hours in the kitchen… and enter for your chance to win a copy of this cookbook! Gooseberry Patch recently gave me a chance to review Almost Homemade. This cookbook is packed full of recipes that taste like you spent hours slaving in the kitchen. The “almost” means that there are plenty of shortcuts to help you save time while still cooking a homemade meal! This Slow Cooker Tomato-Tortellini Soup will warm you up after a long afternoon of playing (or working) outside in the cold. Set it up in your slow cooker and come back in a couple of hours! Love Mexican, but don’t love all the prep work to make enchiladas? Try this Enchilada Casserole for an easy way to have a great Mexican dish at home. There’s also a yummy Sweet Corn & Rice Casserole in this cookbook that would be a great side dish to go along with this Enchilada Casserole! Need a way to get some more veggies in? Give this Cheesy Broccoli Cornbread a try. Frozen broccoli is an easy way to add some “green” to your plate, and it’s still a dish that the whole family will love! Did someone say comfort food? This Slow Cooker Au Gratin Potato Soup is pretty much the definition of comfort food. With easy shortcuts and a slow cooker, it just doesn’t get much better than this creamy, cheesy potato soup. And for dessert, these 4-ingredient Individual Chocolate-Peanut Butter Bars really can’t get much easier! Eat them warm with a scoop of vanilla ice cream to top off your day! Are you ready? Let’s talk about the giveaway! UPDATE: This giveaway has ended and the winner has been notified. Thanks to everyone who entered! To enter the giveaway, all you need to do is leave me a comment below! Tell me your favorite comfort food! One entry per person, please. The winner will be chosen at random from the comments. This giveaway closes at midnight (Central time) on Tuesday 1/12/15. The winner will be notified via email and have 48 hours to respond before a new winner will be chosen. The winner must have a shipping address within the continental U.S.
My comfort food is anything with pasta, Lasagna, spaghetti, my Moms hot dish with noodles, tomato soup and vegetables. I am always looking for a new recipe to try. Fresh warm homemade bread with lots of butter and a glass of milk ! My favorite comfort food is one of two … enchilada casserole or “from scratch” mac & cheese. 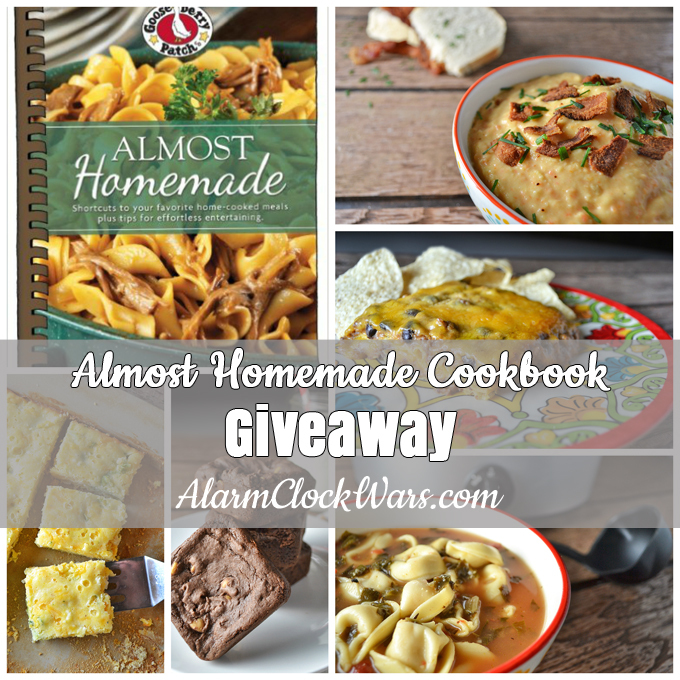 I would love to be able to win a copy of “Almost Homemade”! My favorite comfort food is vegetable beef soup. My favorite comfort food is mashed potatoes and gravy. Beef Stew is my favorite! My favorite comfort food is an old fashioned cheeseburger. My favorite comfort food would have to be a big bowl of homemade chicken & dumplings. My favorite comfort food is homemade mac n cheese. I like pot roast and chicken. I haven’t had home made pot roast in a long time !! My favorite comfort food is homemade mac and cheese! My favorite food is warm bread with butter. My favorite comfort food is spaghetti. My favorite comfort food is my homemade macaroni and cheese! I usually never enter because I never win anything but heres a last try. I collect gooseberry patch and would love to add to my collection. I love all of the gooseberry patch books!!!! When I’m having a rough week, I always look forward to great-grandma’s spaghetti on a Saturday evening. We’ve adapted the recipe slightly through the generations, but it still reminds me of big family dinners, warmth, and love. In fact, I can often find my teenage children’s friends “showing up” when they know a pot of spaghetti sauce has been simmering on the stove. My comfort food? Brownies and a glass of milk. My comfort food has always been meatloaf. Please enter me for the FREE Cookbook! Thanks for the giveaway, I like chicken and egg noodles. I add celery, carrots and an onion to it. Fresh hot bread out of the oven and a big pot of homemade soup with homemade noodles. Thanks for the opportunity to win this cookbook! My favorite comfort food would have to be something with pasta – probably mac and cheese! Big plate of mac and cheese! My favorite comfort food is crockpot potato soup!! Mac n cheese also!! My comfort food is a good cheeseburger with green olives sliced on top of the cheese!!! Your blog is beyond awesome and your efforts are appreciated. My go to comfort food is breakfast (grits, eggs, etc.). A bowl of chili with some warm buttered Italian or Frenchbread! Love your cookbooks and have derived many inspirations from them and your readers. Enchilada casserole…living so close to Mexico we can only get the authenic enchiladas,not Tex-mex…we retired here from Houston and this casserole reminds me of home and all the tex-mex recipes…. My comfort food is meatloaf.